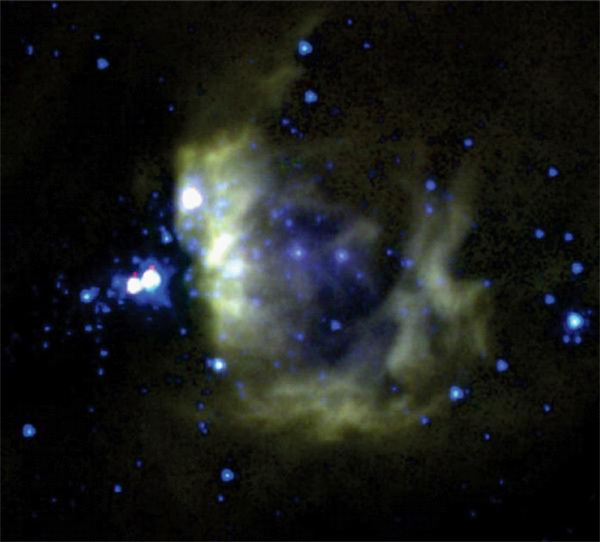 Spitzer Space Telescope infrared image of nebular cloud BYF73. Credit: NASA /JPL-Caltech. Do stars form from the collapse of cold gas and dust? A cloud of gas and dust capable of bearing stars 50 times more massive than the Sun is said to inhabit BYF73, a nebula about 8,000 light years away in the constellation Carina ("the keel"). How such clouds form heavier than normal stars is not known, although infrared observations from the Spitzer Space Telescope appear to indicate that massive young stars already exist in the center of the nebula. Using the Commonwealth Scientific and Industrial Research Organization's (CSIRO) Mopra radio telescope, scientists from an international research group found the cloud of mostly hydrogen gas and dust while conducting a survey of similar structures. According to a recent press release, BYF73 is collapsing in on itself faster than any other "star factory" ever observed. "Evidence" for the collapse comes from spectrographic analysis of two different molecules: hydrogen carbonate anions (HCO+) and hyperpolarized C-labeled bicarbonate (H13CO+). According to standard theories of stellar evolution, Fraunhofer line redshifts in the molecular spectra indicate a rapid infall of material in the cloud. 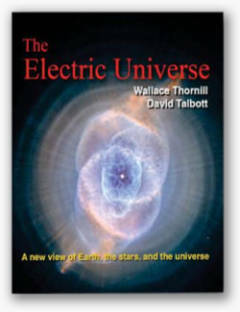 As usual, all analysis is based on kinetic models of gas behavior and not on the mathematics of electrified plasma. The nebular theory of star formation was initially proposed in the eighteenth century by Kant and Laplace, with modifications in the nineteenth and twentieth centuries to accommodate objections. Since gravity is a relatively weak force (one can overcome the gravitational pull of an entire planet by simply lifting one's arm), for a gas cloud to collapse under its own weight it must be cool and possess no magnetic fields. However, in the so-called "stellar nurseries" that have been observed, new stars are always embedded in what appear to be chaotic regions of hot dust, energized plasma, and magnetic fields! The consensus solution to those problems is to conjure shock waves from stellar winds and supernovae ramming through the star-forming regions, pushing the thin wisps of dusty gases into gravitational compression, thereby jump-starting the star forming process. The origin of stellar "winds" continues to defy explanation, though, and shock-heated gases should rapidly dissipate, not collapse. 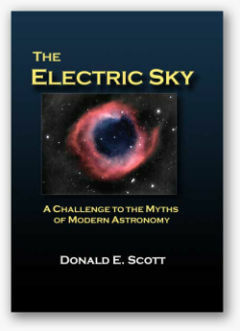 The Electric Star theory resolves many of the distorted opinions that arise from misunderstanding the role of plasma and electric fields in space. Rather than kinetic activity, BYF73 is powered by electric currents. Electric sheaths that are normally invisible are "pumped" with energy from galactic Birkeland currents in which they are immersed. The excess input power pushes them into "glow mode," while increased flux density draws matter from the surrounding space into filaments that ignite the nebular plasma electrically. Electric discharges in plasma clouds create double layers, or sheaths, along their current axes. Positive charge builds up on one side and negative charge on the other. An electric field develops between the sides, and if enough current is applied the sheath glows, otherwise it is invisible. 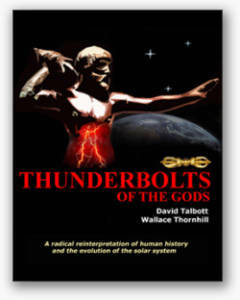 Electric currents flow along the sheaths. In plasma, the currents spiral into filaments, or double layer tubes that attract each other, but rather than merging they spiral around, gradually pinching down into arc mode discharges. It is in this way that stars are born. Gravity, although it plays a small role in stellar evolution, is far too weak a force when compared to the force of an electric field on ionized particles. More massive stars are not necessarily "heavier" than the Sun, they are stronger electric discharges, which are naturally accommodated by the expansion and increasing luminosity of their photospheric discharges. The size limit of stars is not determined by gravity vs. radiation pressure but by electromagnetic forces without and within the growing star.